Susannah Harris worked on both abstract and concrete water conservation agendas. She was able to create a corporate water plan for Verizon's key executives and other stakeholders. Susannah Harris planned to create a corporate water efficiency program for Verizon Communications. Harris took a two-tiered approach to the task, compiling both high-level strategy recommendations and identifying specific water use reduction projects across the company. On the strategy side, Harris calculated Verizon’s water use baseline and used government resources to benchmark Verizon buildings against published averages for similar facilities. She also compiled key water-related metrics from external reporting outlets to highlight best practices across the commercial sector. Finally, she collaborated with staff to embed water efficiency information into Verizon’s ongoing events and communications channels. When it came to specific water efficiency projects, Harris took a data-driven approach. She used historical water use trends to isolate buildings, assets and regions with higher than average water use. Harris then verified her hunches about water “hot spots” through regular conversations with facility managers, real estate professionals and energy experts, both at headquarters and on three site visits. Harris recommended a suite of projects centered on cooling system improvements in various Verizon technical buildings. Harris rolled out her corporate water plan during four executive meetings with Verizon’s Chief Sustainability Officer, Executive Director of Real Estate, Process Engineering staff and other key company stakeholders. Each of Harris's approaches provided Verizon's executives with the information they needed to save water and money. The information she provided on best practices is now part of Verizon's business knowledge. 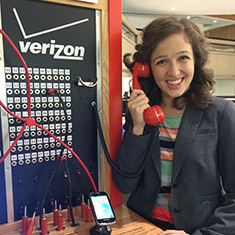 Susannah Harris, a joint MBA/Masters of Environmental Management student at Yale University, was hired as the 2014 EDF Climate Corps fellow at Verizon.